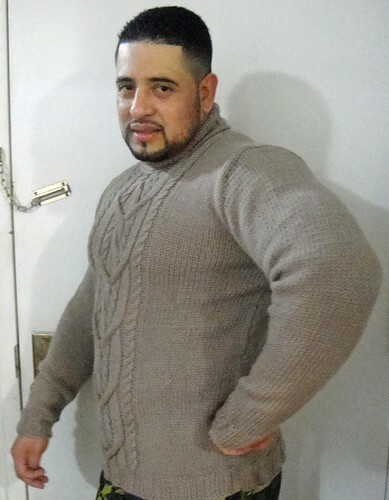 He fills out that sweater quite well doesn’t he? 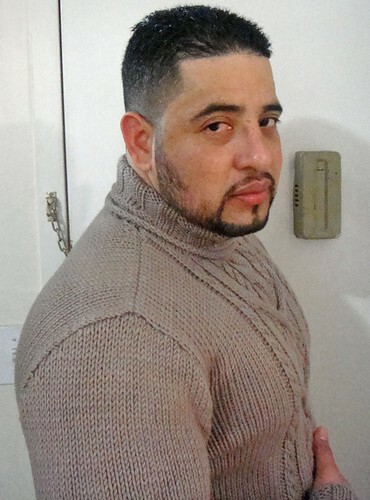 Sigh….My better half lovingly wearing a sweater I made for him – makes me fall in love all over again! 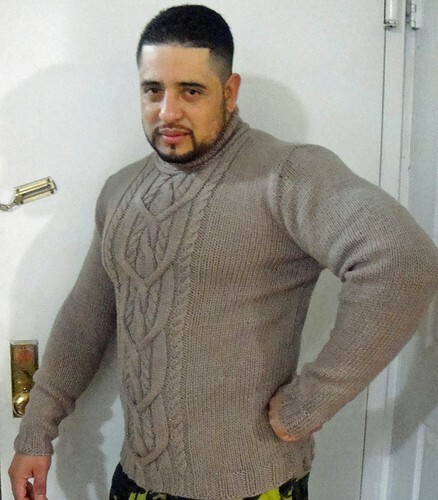 Mods: None really except for using the same size needle throughout the entire sweater (instead of doing the ribbing with a smaller size). I’ve started climbing that mountain! I began by laying out my charts and plans, as mentioned in a previous post. I’m not big on making complicated swatches, but since this is a semi-complicated sweater, I knew there was no way around it. 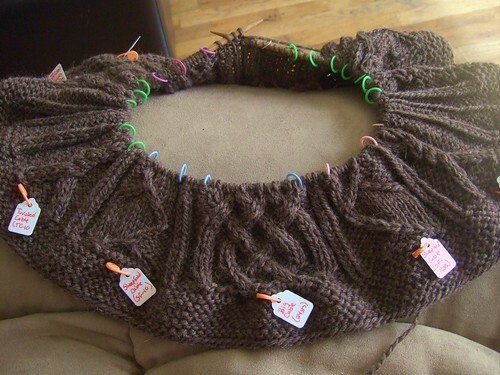 Meg Swansen recommends making a swatch cap in the pattern. 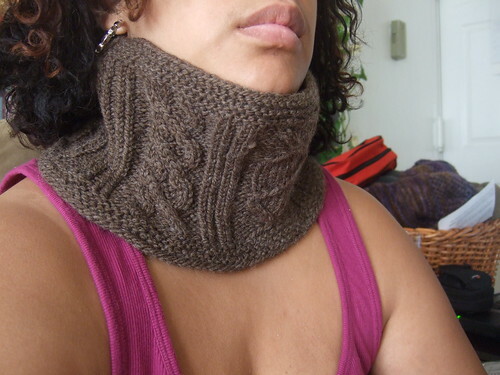 I decided to make a swatch cowl instead. 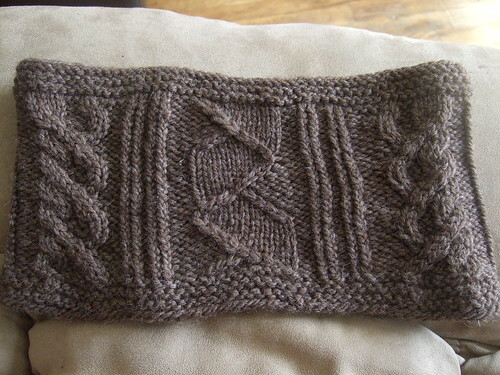 I cast on enough stitches to measure 24″ (gauge of 4.5 sts per inch, 108 sts cast on). 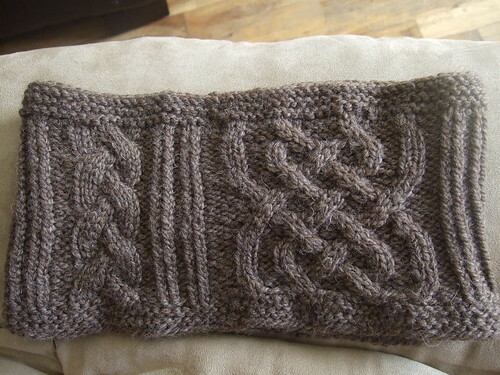 I used one of each of the cable motifs I planned on using in my sweater and also the filler pattern (p2, k1 or 2 tbl, p2). I then soaked my cowl and it finally dried. Can I tell you how in LOVE I am with this yarn and pattern???? 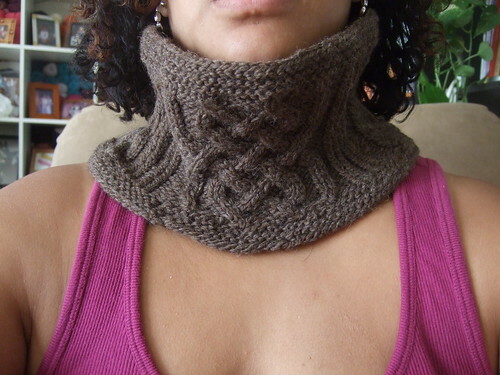 I can understand why people are so into cowls these days now. 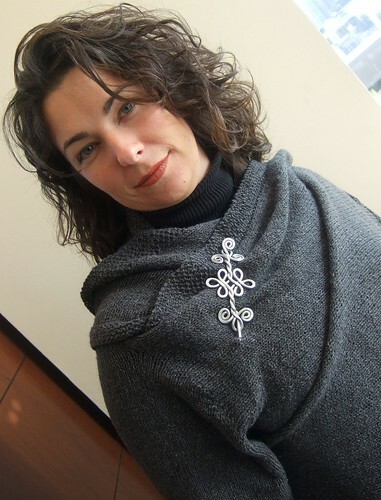 When you find a nice, soft yarn and a fun stitch, it’s great to make a quickie project that you can wear right up against your neck. I want to know why Cascade Ecological Wool isn’t more popular. It’s relatively inexpensive with a MASSIVE amount of yardage in one skein. I’m absolutely positive that I will use this yarn again. It’s a pleasure to knit with. It’s soft even before soaking. With the soak, it’s even softer. 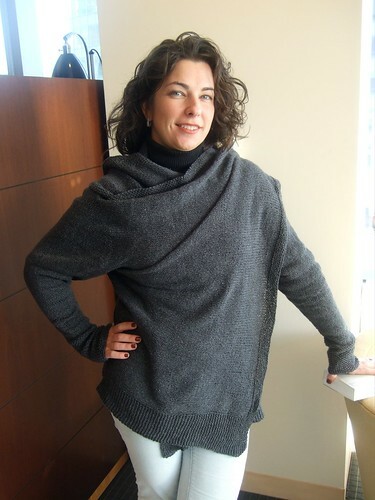 It feels great against the skin and not totally scratchy as some natural 100% wools can be. After having swatched all of my motifs, I realized that I didn’t want to use all of them. I swapped out two of them (shown on the left and right in the picture above) and replaced them with one single twisted cable (shown in the picture below). 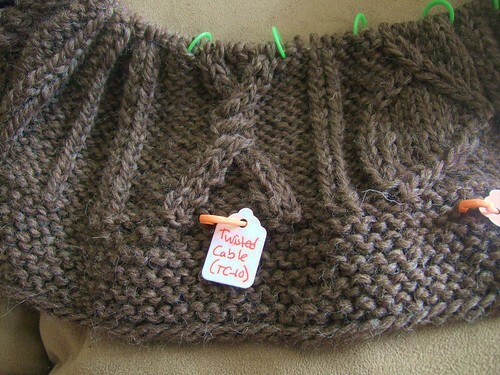 I think it’s going to work out better since the yarn shows off twisted cables really well. I haven’t wanted to put this puppy down since I started it yesterday so I’ve been ignoring all of my other gazillion WIPs. But, stay tuned as I do have a new free pattern in the works!